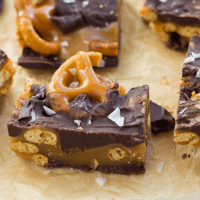 Gluten-Free Dark Chocolate Sea Salt Caramel Pretzel Bark. (Snappers Knock-Off!) These are EASY, dangerously delicious and make the perfect holiday food gift. I use the gluten-free pretzels from Trader Joe’s or Glutino brand. Any kind of chocolate chips will work here, just be sure they are gluten-free. For the caramel, in a medium heavy-bottomed saucepan, add the butter, salt, corn syrup, sugar and 1/2 cup cream. Heat over medium-low and gently melt the ingredients until the mixture is smooth. Increase the heat just slightly to bring the mixture to a simmer. Clip a candy thermometer to the side of the pot and simmer on medium-low without stirring until the caramel reaches 236 degrees. Carefully pour in the remaining 1/2 cup cream and again, without stirring, cook the mixture until it reaches 245-248 degrees on the candy thermometer. Turn off the heat, swirl in the vanilla. Let the caramel cool for 10-15 minutes before using. Melt 8 ounces of the chocolate gently in the microwave on 50% power or in a double boiler until smooth (careful not to overheat). Spread the chocolate as thin as you can evenly over the parchment. Before it sets while still wet, sprinkle about 8 ounces of the pretzel twists over the top. It’s ok if the pretzel twists are overlapping a bit. Gently press them into the chocolate (the caramel will act as the glue that keeps everything together). Once the caramel has cooled slightly, drizzle it across the top of all the pretzels. Sprinkle the remaining chocolate chips over the warm caramel and let it sit until the chocolate melts. Once the chocolate has melted, spread lightly with a knife or thin metal spatula. Sprinkle with sea salt. Let rest until the chocolate on top has hardened. Cut into pieces and store in an airtight container. Enjoy!